This sign frame is an ideal example of contemporary elegance. 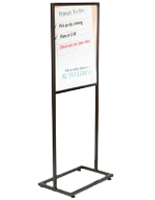 This sign display stand, sign frame is designed to display 22"w x 28"h posters. 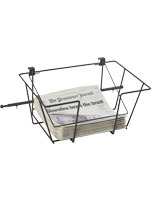 This sign frame, also known as a display stand, is made of quality metal and features an upscale, glossy black finish. 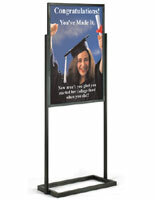 The finish allows the sign holder to easily fit into any setting. 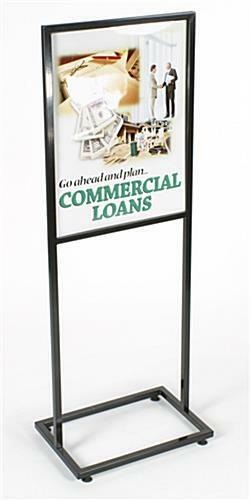 This sign frame is perfect for use in restaurants, retail stores, bookstores, banks and universities. 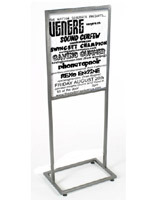 A sign frame, such as this poster stand, is ideal for advertising in-store promotions, special sales or for promoting events! 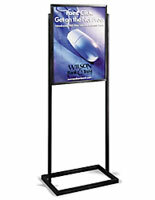 This sign frame features a top-insert design for fast and easy graphic changes. Graphics can be changed by inserting them into the top slot of the sign frame. When printing your graphics, we recommend the use of heavier graphic materials or boards, as we do not include the sign stand with plastic lenses or backing materials. 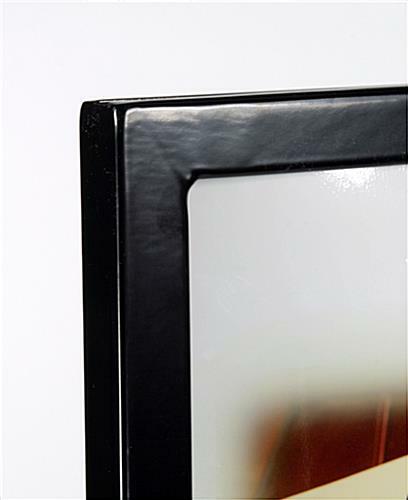 Unlike our MFPH1BLK series (see related products below), posters are held in place only by the grooves in the frame. The graphic slot measures 1/4" deep. 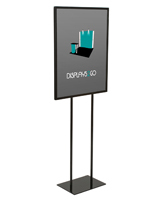 This sign frame is also double-sided to maximize poster exposure. 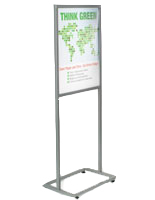 We provide the sign frame with four levelers to stabilize the stand on uneven floors. The sign frame is shipped unassembled, however, it takes only a couple minutes to set up. This sign frame delivered and was missing the base to make it stand up. I contacted Customer Service and have not gotten a response yet. I asked that the missing part be shipped ASAP. No response and useless sign frame without the base. Christina, we sincerely apologize that your frame arrived without the base. 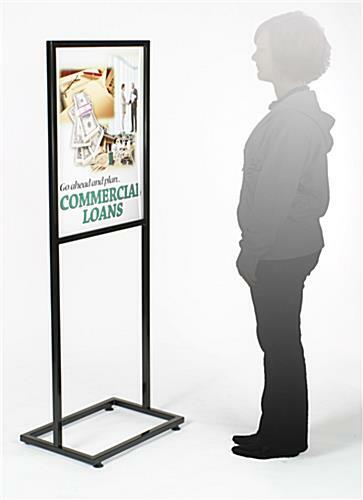 A customer care specialist will follow up with you shortly to provide a solution, so you can use your poster stand as soon as possible! Thank you for bringing this to our attention! These worked well for about 2 weeks and then they started breaking, leaning and becoming loose. I've had to tighten them and replace a few for multiple reasons. Our frame to place the signs are all bent and hard to insert our boards that are a little thicker. Love the idea of these and they worked great at first, but not very good quality for long term use. Morgan, we are so sorry that the unit you received was not as durable as you should expect. We'll have our customer care team reach out to provide a solution. Thank you for bringing this to our attention. Super easy to set up, and nice looking to a presentation. Really like it. This was super simple to put together. There are the four adjustable feet and the two bolts that hold the upright part to the base, and your up and running! The material looks to be like it will be strong enough to last a long time. I'm very happy with my purchase! Thank you for the review, Taylor! We're glad you found exactly what you're looking for! 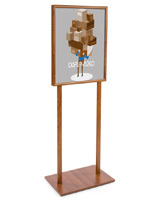 I was looking for some large sign holders that would be durable but aesthetically pleasing, and this fit the bill! Other sign holders like this had tabs that held the sign in place, but this one has slots built into the frame, making it sturdier. It also holds signs up to a quarter of an inch thick, which gives me a lot more options for materials. Very excited to use them! What a great photo, Taylor! Thanks for sharing and for providing us with the great review, too! 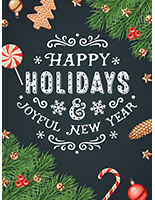 We hope to hear from you again soon.